Take a look at these legs. Have you seen anything similar in a client, patient or perhaps yourself? This gent came in with knee pain and we were looking at his feet. It turns out that this was a reaction to an antibiotic he had taken 3 years ago! Hyperpigmentation can be caused by bacterial infections, congenital problems, lime Cafe au Lait spots, endocrine disorders, like Addison’s disease and hyperthyroidism, hemochromatosis as well phototoxic reactions from the use of systemic or topical antibiotics (1, 2) or from contact with certain plants or foods in conjunction with sun exposure (3). Often initially, patients develop an reddened skin response caused by an allergic reaction. The inflammatory response often includes lymphocytes, eosinophils, and edema, which can result in a “blister like” reaction on sun-exposed skin. Over time, hyperkeratosis and melanocytic hyperplasia (increased numbers of the cells that give your skin pigmentation) develop, causing hyperpigmentation (1). Keep your eyes open! Who knows what the medications may have done to thwart your efforts in the healing response! Gould JW, Mercurio MG, Elmets CA. Cutaneous photosensitivity diseases induced by exogenous agents. J Am Acad Dermatol. 1995;33:551–73. Pepine M, Flowers FP, Ramos-Caro FA. 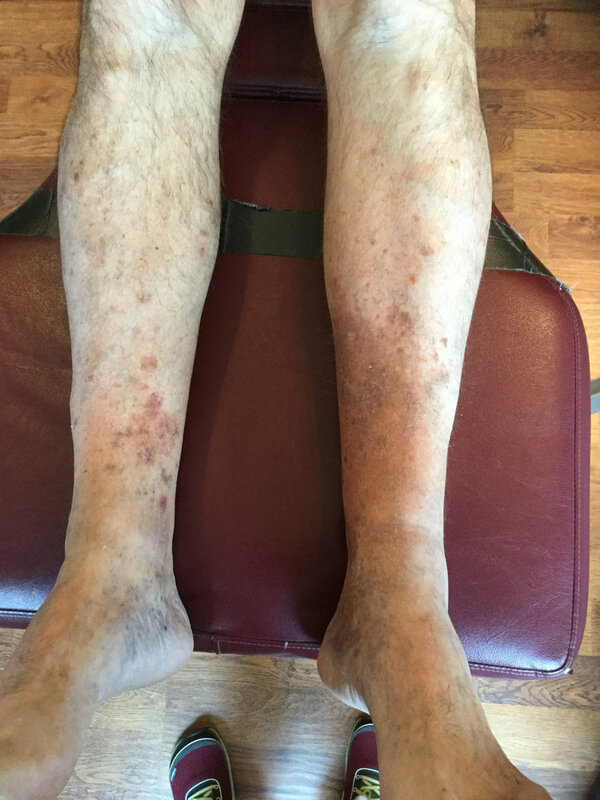 Extensive cutaneous hyperpigmentation caused by minocycline. J Am Acad Dermatol. 1993;28(2 pt 2):292–5. Kelly AP. Aesthetic considerations in patients of color. Dermatol Clin. 1997;15:687–93. Friedlander SF. Contact dermatitis. Pediatr Rev. 1998;19:166–71.